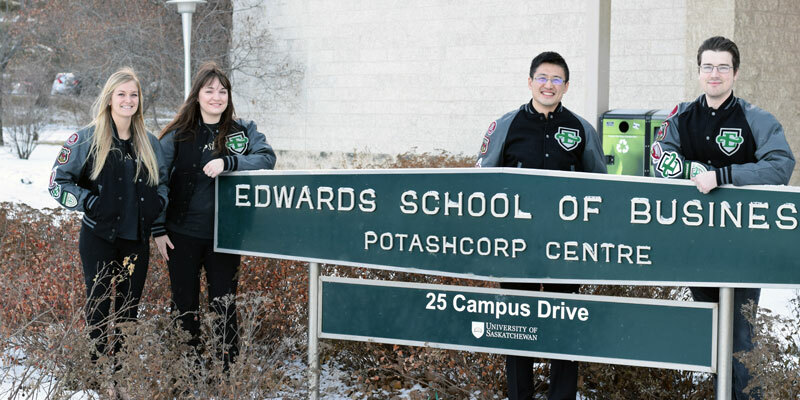 This January, a team of four MBA candidates from Edwards School of Business competed in the 2018 MBA games in Ottawa, Ontario. Hosted by the Telfer School of Management at the University of Ottawa, the event brings 700 MBA students together from across the country. Now in its 30th year, the three-day event is an opportunity for business students of all different backgrounds and home schools to come together and compete in events that test their academic acumen, athletic prowess and team spirit for a chance at the prize: the Queen’s Cup. Nicole Adams, Christianne Blais, Tate Cao and Troy Shapley represented Edwards and took home 4th place out 17 teams competing in the strategy case. The students were challenged to incorporate diversity and inclusion as part of the overall theme of the competition; ‘More Together.’ The theme implies striving to work in diverse and inclusive environments creates more innovation through diverse perspectives, work experiences, lifestyles and cultures. A big focus of the competition was also fundraising, with each competing school encouraged to raise money for the Moose Hide Campaign. The Moose Hide Campaign is a grassroots movement of Indigenous and non-Indigenous men and boys who are standing up against violence towards women and children. Special thanks to the Grandy Leadership Initiative, Edwards Dean's Circle and ISAAC for financial support. The University of Saskatchewan and the Edwards School of Business congratulate our MBA students on this achievement!